Kata C2 With Metal Build And Fingerprint Scanner Now Official, Priced At PHP 3999! Home / kata / mobile / news / Kata C2 With Metal Build And Fingerprint Scanner Now Official, Priced At PHP 3999! 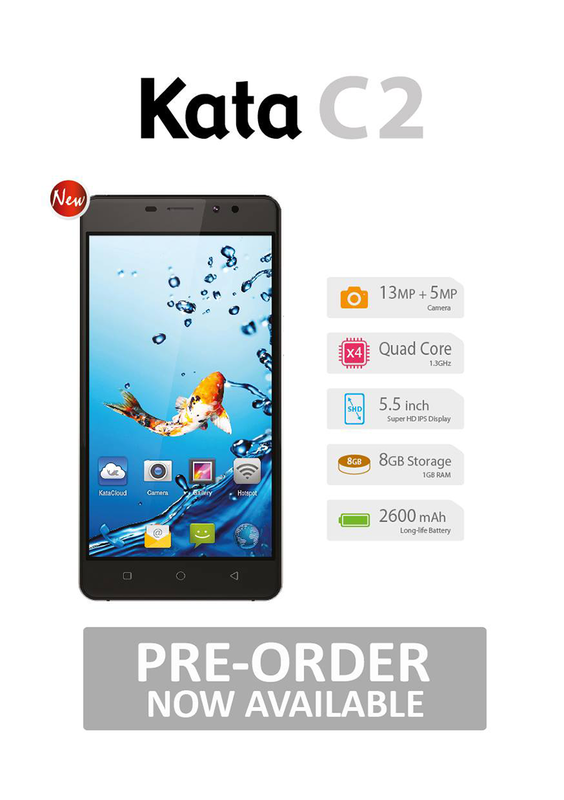 Along with the Selfie flagship, Kata Philippines has introduced the Kata C2 on their Facebook page. It's a budget entry-level handset with beautiful metal build and responsive fingerprint scanner behind. Related: Kata Selfie, i5, And C2 With Metal Clad Design And Fingerprint Scanners This December! The Kata C2 comes with a 5 inch HD IPS screen, 1.3 GHz MT6580 quad core chip paired with Mali 400 GPU, 1 GB RAM, 8 GB of expandable internal storage, and 2,600 mAh of battery capacity. It also has an 8 MP main camera w/ AF and LED flash plus dedicated shutter key. In front, a 5 MP front camera w/ fixed focus will handle your selfies. The handset is now available for pre-order at Kata stores nationwide for PHP 3,999.